34.55mm x 43.9mm by 9.3mm thick palladium case set with brilliant-cut diamonds, sapphire crystal back, octagonal crown set with a brilliant-cut diamond, sapphire crystal, skeletonized dial with blued steel sword-shaped hands, 18K white gold DADB Caliber 9611 MC manual winding movement with hours and minutes and skeletonized bridges in the shape of Roman numerals, black alligator-skin strap, 18K white gold double adjustable deployant buckle set with diamonds. Water resistant to 30 meters. 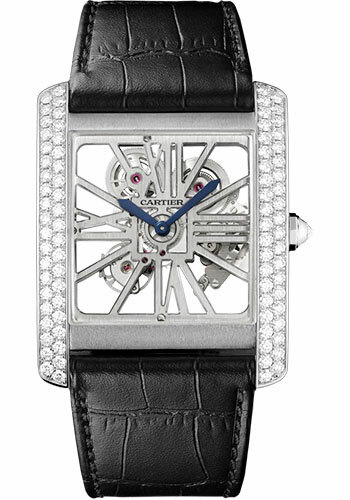 34.55mm x 43.9mm by 9.3mm thick palladium case, sapphire crystal back, octagonal crown set with a synthetic spinel, sapphire crystal, skeletonized dial with blued steel sword-shaped hands, 18K white gold DADB Caliber 9611 MC manual winding movement with hours and minutes and skeletonized bridges in the shape of Roman numerals, black alligator-skin strap. Water resistant to 30 meters.